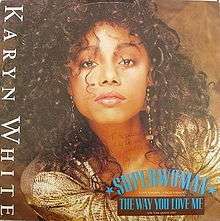 In 1991, the song was remade by Gladys Knight, with help from Patti LaBelle and Dionne Warwick, and it was featured on her album Good Woman. Norman Cheung and Faye Wong also released a cover version of "Superwoman" entitled "Because of Him" on her 1990 album You're the Only One. Malaysian Singer Gary Chaw had a Mandarin cover version, also named Superwoman, on his first album Blue in 2006. The song was covered by Malaysian Idol season 1 winner Jaclyn Victor in 2006 on her second album, Inilah Jac. Heather Headley also covered it in her mini concert. It is often covered in Chinese and Taiwanese singing competitions, notably Janice Yan and Jeanie Lee. In 1989, Norman Cheung made an atv cover version in Cantonese. In 1990, Chinese Diva Faye Wong made a tvb cover version in Cantonese. In 2006, Gary Chaw made a cover version of the song in Mandarin. In 2006, Japanese reggae singer Metis covered the song for her album Woman. In 2012, Heather Headley covered the song for her Only One in the World album. ↑ Whitburn, Joel (2004). Top R&B/Hip-Hop Singles: 1942-2004. Record Research. p. 621. ↑ Whitburn, Joel (2002). Top Adult Contemporary: 1961-2001. Record Research. p. 256.